Yes, folks, the Keep Calm Squirrel is back AGAIN with his funny antics. And this time, he's wearing a crown! What could be more appropriate than to listen to the advice of the King of Squirrels? The royal "Keep Calm and Carry On" poster used by the British government right before World War II has taken many forms since becoming a recent pop culture icon. You can also buy this Keep Calm Squirrel shirt as cards or posters at Redbubble. Perfect for "get well" cards. In the face of various life crises, this type of card will direct the recipient to keep calm and eat birdseed until things get better. 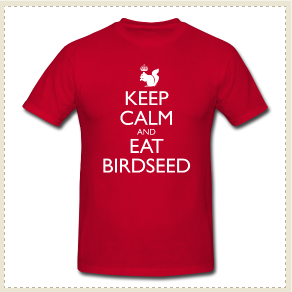 This funny parody clearly tops them all, unless you prefer acorns to birdseed, in which case, check out this shirt: Keep Calm and Eat Acorns. You might also like this one: Keep Calm and Squirrel On.